I have done a fair bit of research into the whole Group 19 thing and it is interesting and a definite case of AMC trying creatively to make up for their lack of resources. Unfortunately they missed the mark, with the program neither widely used nor being legal for most racing. You know, the mention above of the SAE papers made me think of something. I wonder if they would be a basis for a challenge to the rules for Pure Stock? The SAE papers includes almost every Group 19 piece with part numbers, listed as "service parts". The other thing is that I suspect that what they were trying to avoid with the "no dealer modified vehicles" is things like Baldwin Motion cars, Dana, Tasca Ford, etc. Those were specific dealerships serving a limited sales network or area and not supported by the factory. Furthermore there was no standard on the cars as to what was installed, so they would become a free for all. AMC listed the parts as options and they were specific parts available at any dealership, promoted by the factory. Biggest hurdle might be the need for a warranty. Unfortunately, it's very simple. If it wasn't installed at the factory, on the assembly line, it isn't legal at the PSMCDR. Nothing can or will change or challenge that. My personal thoughts are that AMC did some incredible things during a time on the company when it wasn't easy to do so. I don't think they had the means to cover warrenty claims on hi revers that guys would shell regularly with other makes who could. If you look at what lil AM offered as potential, it was darn good ! I wish they'd have offered a few throw caution to the wind packages, to legitimize cars wer could have cloned today for these events. This is a little laughable now, but back it 1995, when I first became aware of PS style events, I thought about the potential a 401 XR Gremlin would have there. The internet wasn't around yet and I didn't know the factory assembly line rule yet. I saw and purchased a 401 XR Gremlin anyhow, as one came up for sale and my interest in them had already been piqued. I wound up selling it not long after the purchase because of marriage, house expansion, and the beginning my family commitments. That same car is now restored and will make it's debut at this years Muscle Car and Corvette Nationals in Rosemont IL. Nov 17th and 18th 2018. As for those who poo poo the Autolite 4300's, I respectfully disagree and I think they're good carbs., just misunderstood. My personal opinion is that the biggest thing they suffer from is being cycled through rebuilders who mismatch components and don't set them up right. I've has reason and occasion to put one through the paces on my 68 AMX with 68 390. I want to run one at the track once, just to see if my car runs quicker and has higher trap speeds. They feel stronger than when the AFB is on there. Best ET to date with my car is 13.44 and my best MPH is 104.69. I've never had a sub 2 second 60' with it : ( I'm hoping to rectify some of the things it ails from by next year, to include some solely needed cosmetics. I'd be thinking 72 on Javelin/AMX for this, the extra 1.5 compression allowed would help the low comp 401 a lot with the mild cam restriction plus you get the 727 and free flow manifolds. What are you allowed to do with the trans if anything? Do you need to retain the factory smog equipment? The flow conversion is the square root of the delta P, so 430 @ 1" hg is 527 @ 1.5" hg. Your car is a beauty Joe, it was great seeing it and talking to you at GAD! I take that as a huge compliment coming from you Tony, thanks man! I was great meeting you too and getting to see that awesome AMX of yours. Maybe we'll get you to bring it to the pure stock drags one of these years! I would totally be into bringing it out but unfortunately she has a few parts that would make her "not stock" therefor not eligible to race. Intake, carb, exhaust and the slightly bigger than stock cam. That and she is fat with all those options! I've ran her at my local track with a PB of 14.3 @ 96. At Byron after the AMO Nationals I ran IIRC a 14.7 with no tuning changes. In fact I haven't put a timing light on the car since I fired the car for the first time! You should empty all your goalie equipment out of the trunk next time. As Joe pointed out earlier, we need to observe the two classes of racing here. Pure Stock Muscle Car Drag Race (Pure Stock) and Factory Stock are pretty much the same thing. Some small deviations from factory are allowed like exhaust upgrades to 2.5 " and 1.5 point bump from advertised compression, one tire size up from factory spec. . No porting, no extrude honing, casting numbers and general part numbers must be factory correct. F.A.S.T. (Factory Appearing Stock Tire) was born from the guys that had their own very liberal interpretation of the rules . There the cars must appear stock and run stock appearing parts but all possible internal modifications you can think of to engine, transmission, weight, are allowed. One mod there is to take a 727 and run heavy duty 904 guts which free up power by reducing parasitic drag. There are tons of tricks to get those cars to run the numbers they do. Compression ratio = skies the limit. I leave that in for weight bias. Yes, I was referring to the Pure Stock class, thinking a 1.5 boost in compression would be more useful with the mild cam restrictions on a low compression 401 than it would be on say an already high compression 390. Most talk here has been about engine specs, I was just interested on what could or couldn't be done with the transmission since you could probably do more with the TF than the BW if choosing to run auto. What about torque converters? You are not required to run the factory smog equipment. It can be removed. This of course would be moot on automatic transmission cars, since they were not required to run smog equip..
Converters suppose to be of stock stall. 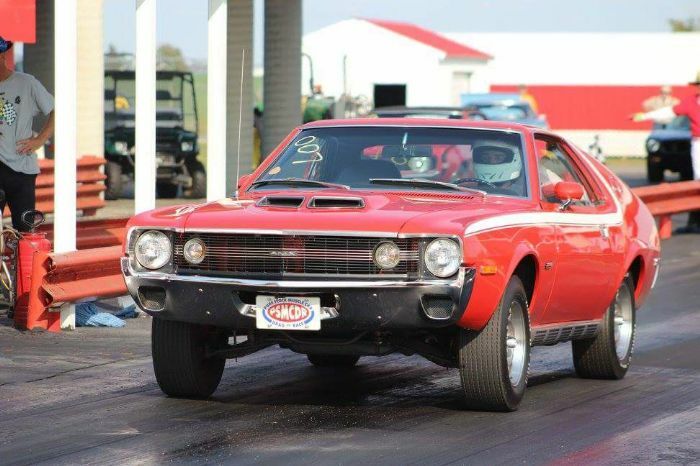 Go to: http://psmcdr.com for all rules, past results, contact info, and more about the Pure Stock Musclecar Drag Race. The transmission must be correct for the year, make, model, and horsepower claimed. Shift improver kits are allowed. Aftermarket shifters are not allowed. No manual valve bodies. Lightweight purpose-built, drag racing transmissions NOT allowed (for example Pro Trans, Kilgore, etc.). Just switching to aluminum drums is illegal. Anyone caught will be banned from the event until corrected! Torque converters must be within 1 inch of the stock outside diameter. Maximum stall limited to 2200 rpm. Higher stall speeds will require factory documentation.